We were told that the 2012 changes to England’s student funding system would boost the number of part-time students at university. But new data released by the Higher Education Statistics Agency confirm that such predictions were wide of the mark. In fact, there were 30% fewer new, part-time, first degree enrolments on undergraduate programmes in 2013-14 than there were in 2011-12. Prior to 2012, part-time study was rising in popularity. The Browne Report into English higher education recommended that those studying for an undergraduate degree part-time should be given the same access to funding, proportionately, as those studying full-time. The previous method of up-front fees, it claimed, “put people off from studying part-time and stopped innovation”. The subsequent government white paper, Students at the Heart of the System, accepted Browne’s recommendations about finance for part-time study and went further still, promising “a more diverse sector with more opportunities for part-time or accelerated courses, sandwich courses, distance learning and higher-level vocational study”. According to free-market logic, with universities deregulated and therefore more responsive to student demand, flexible learning would become the norm and part-time enrolments would rise. The graph below tells a different story. The annual number of new students enrolling part-time on a first degree fell by 15,820 (20.3%) in 2012-13, then by a further 8,005 (12.88%) in 2013-14. As a result, the proportion of all new undergraduate students that are enrolling on a part-time basis has dropped from 14.11% to 10.37%. The slide is a cause for concern because many part-time students are “from backgrounds under-represented at universities”, according to the white paper. They are the “forgotten” group in higher education, their absence not receiving the attention it might because of a tendency for public discourses to focus on more positive trends among young, full-time students. 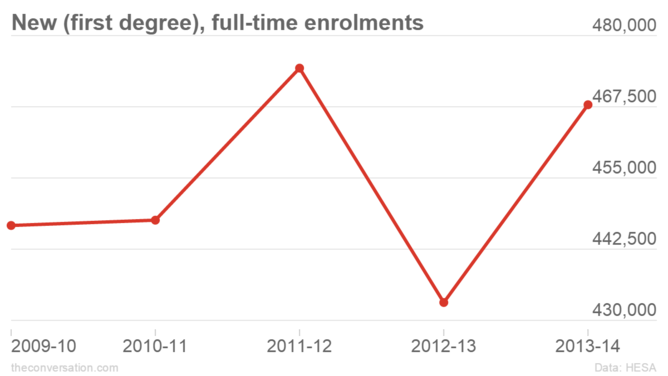 As the second graph shows, although enrolment rates for new, full-time, first degree undergraduates dipped immediately after the fee rise, they recovered in 2013-14. This recovery allows claims to be made that higher fees do not deter demand for higher education. Applications from lower socio-economic students also appear to have risen within this group since 2012. 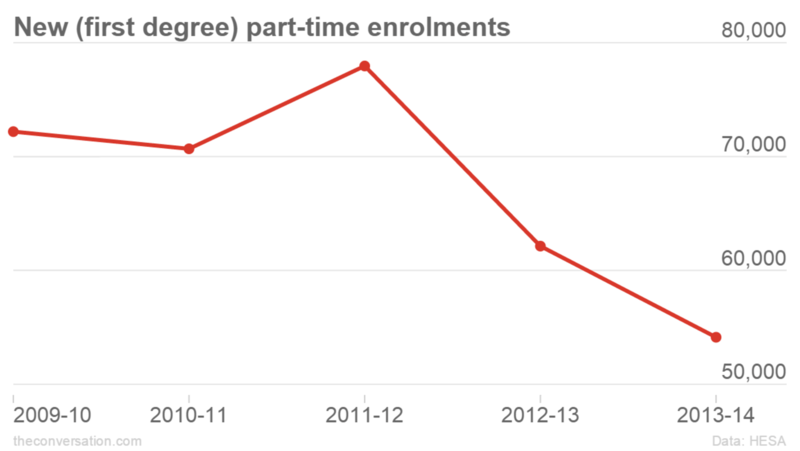 However, enrolment rates for new, part-time, first degree undergraduates have not recovered from their dip. Even for full-time students, it may be premature to hail the 2012 system an unqualified success. A lack of meaningful labour market alternatives to higher education may skew the figures for the current crop of students. The number of young people choosing to study abroad, though still lower than leaders of independent schools imply, continues to rise. But, as a former leader of the National Union of Students Aaron Porter points out, the main reason to be cautious is that the data relied upon for good-news participation narratives generally exclude the huge number of students who are not full-time. Why are part-time students disappearing? Claire Callender, a higher education policy researcher at Birkbeck College, notes that part-time students face problems with eligibility criteria, and that employers may be increasingly reluctant to fund higher education courses as fees rise. Campaigns by the government and by individual universities may implicitly target the “typical” (young, full-time) student. 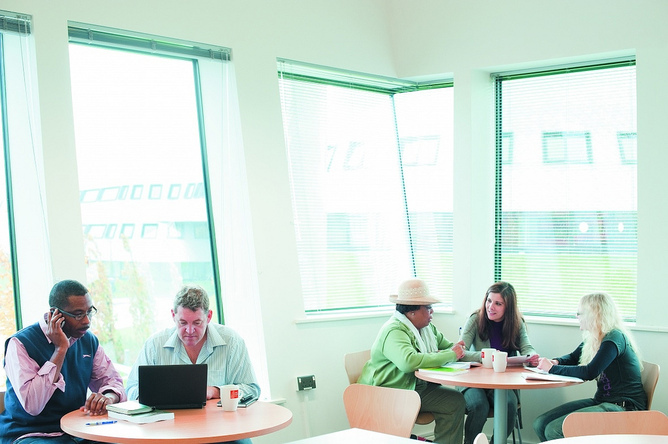 Drives like Universities UK’s “Part-Time Matters” aim to address the problem through clearer communication to those considering part-time study. Yet opportunities are not distributed equally between institutions – and more selective universities may find part-time students limit the speed with which they can launch and withdraw degree programmes, as market forces ostensibly demand. The effect of higher fees on part-time students is also poorly understood. It could be that those students most likely to be part-time are also those most likely to worry about placing themselves in substantial debt. The Sutton Trust charity demonstrated that the 2012 student loan system requires that graduates pay off their debt for longer than under the previous system, and that they repay more in total. Budding part-time students may be deterred disproportionately, especially if their opportunity cost is greater because they already have work. Cost-benefit analyses soon become less straightforward, and the “graduate premium”, so often cited by advocates of the 2012 system, becomes less directly relevant. The government white paper characterised the 2012 funding changes as “a major step in terms of opening up access” and predicted that “up to around 175,000” part-time students would benefit. In reality, the opposite has happened. This fall in part-time undergraduate enrolments, if not reversed, will have significant consequences for the make-up of higher education and, in due course, for the nation’s workforce. This entry was posted in 2012 Fee Structure, HE Marketisation, Participation and tagged Admissions, Enrolments, Part Time. Bookmark the permalink. ← The UCAS personal statement: “just enough rope for a hanging”?